Today there are hundreds of models of climbing shoes to choose from. 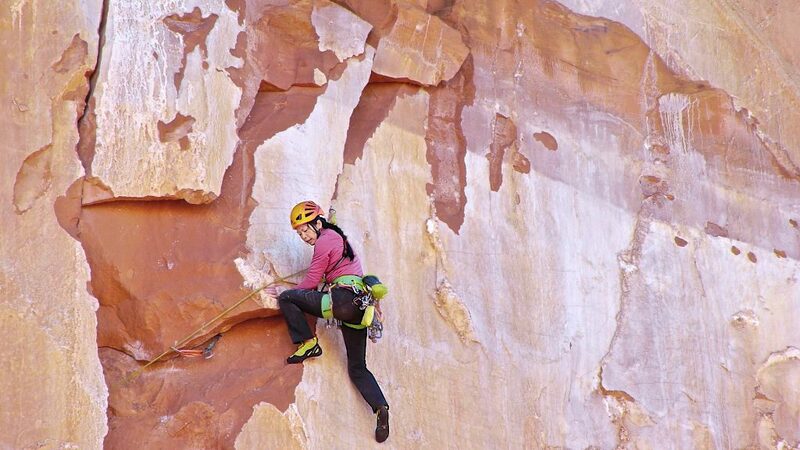 But if you are looking for a climbing shoe that can smear, edge, climb cracks, and be comfortable enough to wear all day on multi-pitch routes, your options can be counted on one hand. A trad climbing shoe also needs to be designed and constructed to take the abuse of being constantly jammed into cracks of various sizes. 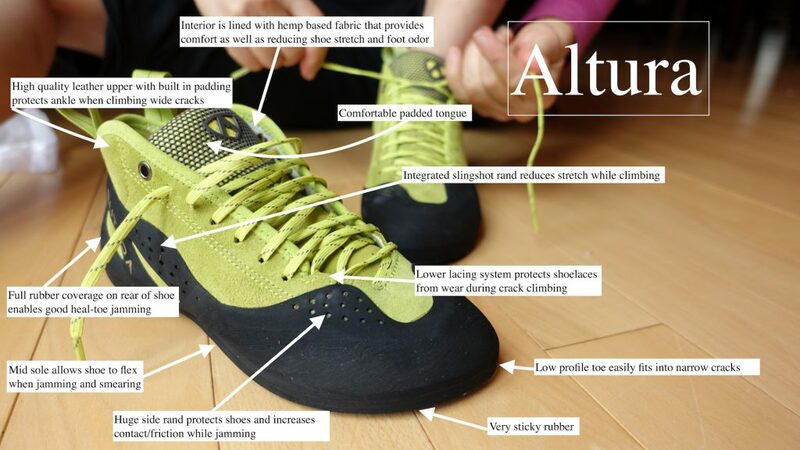 The Altura by Butora fulfills all of these criteria and is, in my opinion, the best crack climbing shoe available today. 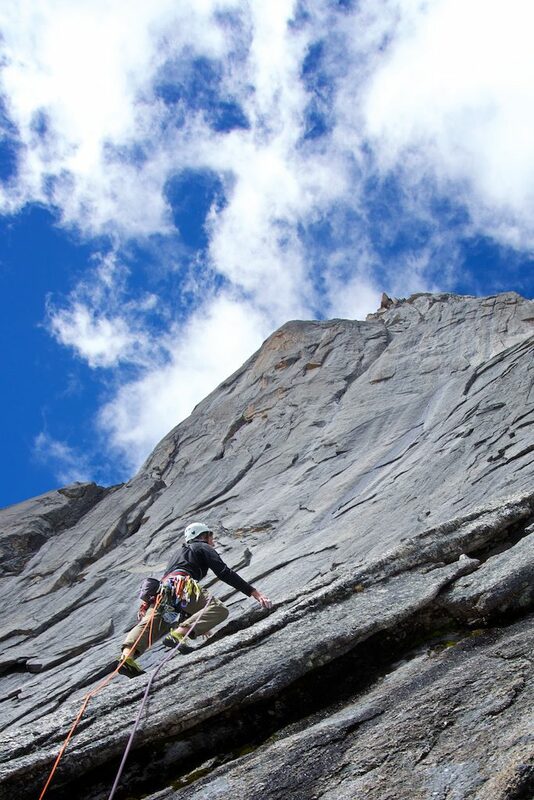 Any climbing shoe can be used to climb cracks, but very few are specifically designed for that task. The Altura has a number of features that allow it to excel at climbing almost any type of crack while providing maximum comfort to the climber. 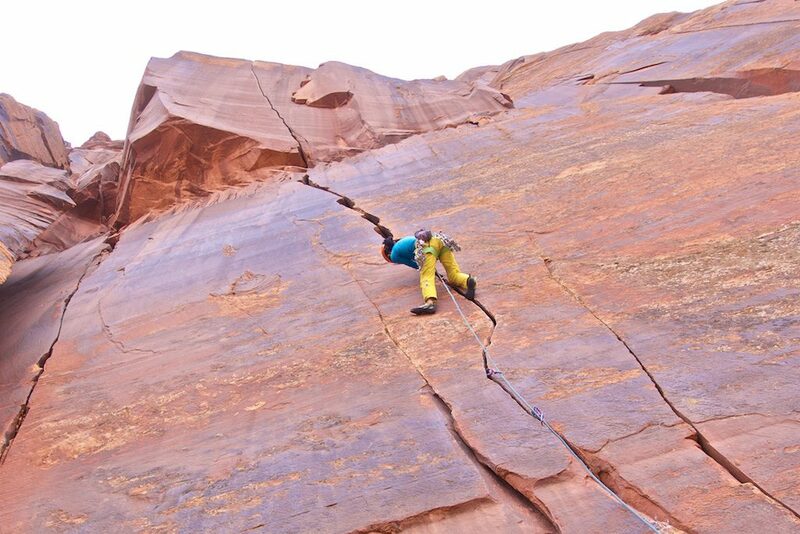 When climbing wide cracks, where your whole foot is jammed into a crack, the skin on your ankles takes a beating. I still have scars on my ankles from thrutching up the Harding Slot 20 years ago while climbing Astroman in a pair of low cut climbing shoes. The Altura solves this problem with mid height upper and a sewn-in foam padding to protect the ankles. When jamming your feet in the cracks that are smaller than four or five inches in width, you typically turn your ankles and insert your feet with your big toe facing up and your pinky toe facing down in the crack. The jamming action and gravity cause most of the pressure to rest on the outside of your foot. The Altura’s have a wide sticky rubber rand that covers the outside edge of the shoe. This large rand does three things. It protects the shoe from wear, provides more comfort to your outside toes and the additional rubber creates more friction to help keep your foot connected to the rock. The rand continues toward the back of the shoe connecting with rubber from the sole to create a heel cup that maintains the shape of the shoe and gently pushes the foot forward to increase performance while edging. In addition the lacing system near the toe is designed so the leather of the Altura protects that laces from abrasions when the shoe is jammed in a crack. The Altura is made of the finest materials and is painstakingly crafted to produce a climbing shoe that not only fits and performs at a high level, but also lasts a long time. The upper is made from German hydrovelour split leather which is tough and breathable. European cows tend to be smaller and their leather is more expensive than cows raised in the US. However, unlike the stretched out belly leather of US cows, the European leather is more consistent in quality and produces a better climbing shoe upper. The lining of the shoe is made from 100% Organic Hemp. This is used for three reasons. First, hemp is a sustainable product that needs less water and fewer pesticides to grow than cotton. Second, unlike synthetic materials bacteria do not like hemp and as a result your shoes will resist foot odor longer. Finally hemp does not stretch, so your shoe will retain their original form and function. The tongue is made from breathable mesh and cushy Poron foam for maximum comfort. Butora is the only company that uses a full length ABS mold in all of their shoes. ABS is an expensive material that forces the shoe to hold the shape of its initial design throughout the life of the shoe. Butora places ABS between the rubber and the rand, instead of a flimsy piece of paper mesh that other companies typically use. As mentioned above the Altura has a large protective rand on the outside of the edge shoe. Most climbing shoe manufacturers just glue the rand to the shoe. Butora goes another step and sends the shoes through a heat mold after gluing, that creates a more permanent seal between the rubber and the rand to prevent delamination. One of the main downfalls of other shoes in this category (Sportiva’s TC Pro and Evolve’s Astroman) is the rand quickly delaminates from the shoe. For the soles of the shoes, Butora uses Neo Friction rubber, which has the highest concentration of butyl of any shoe rubber on the market. Butyl is the material in the rubber that makes it durable and hold its edge. I started climbing in the early 1980’s and have always struggled to find a pair of climbing shoes that fit my feet. You see, I have Fred Flintstone feet. My feet are rather wide and all my toes are the same length. As a result, I had two options. One, buy a smaller size of climbing shoes that edged well but crushed my pinky toe when jamming in cracks; or Two, buy a larger size that allowed my toes to be comfortable when jamming, but were too sloppy to stand on small face holds. Lucky for me, all of Butora shoes are available in two widths, normal and WIDE! I fit the Alturas so that my toes are a little crunched, but can still lie flat in the shoes. When jamming your feet into cracks you do not want to have your toe knuckles bunched as this will be extremely painful. 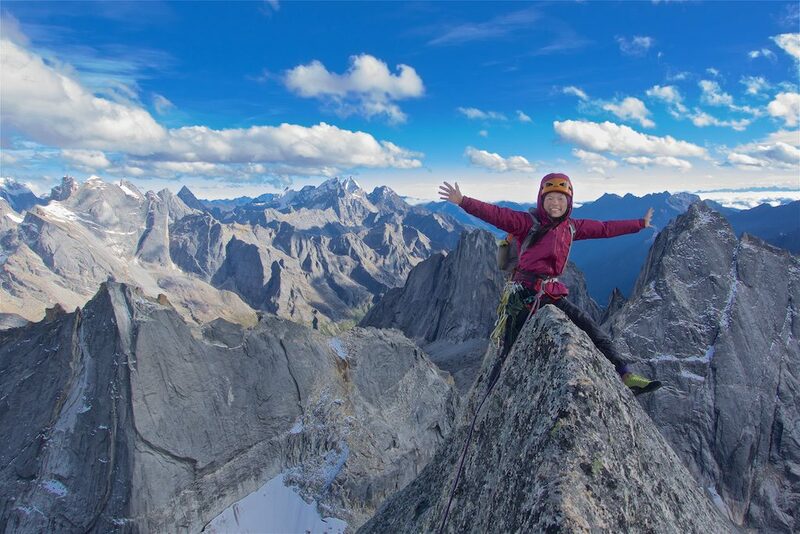 I received my first pair of Altura’s in the fall of 2014 the day before I left for China to attempt an unclimbed route on a 18,000ft peak. I took the shoes out of the box, bouldered around on my brother-in-law’s stone retaining wall (there were no real rocks nearby) put them in my pack and hoped for the best. A month later at 17,000ft while delicately smearing up run out slab, I was extremely thankful Butora had produced such an awesome climbing shoe. Since that time I have used the shoes on a variety of rock types in different climbing areas around the world. I smeared, edged and jammed in the granite of Joshua Tree, Squamish, Yosemite, the limestone of Wild Iris, Sinks Canyon and Saint George, even on the crumbly volcanic rock of Shiprock. 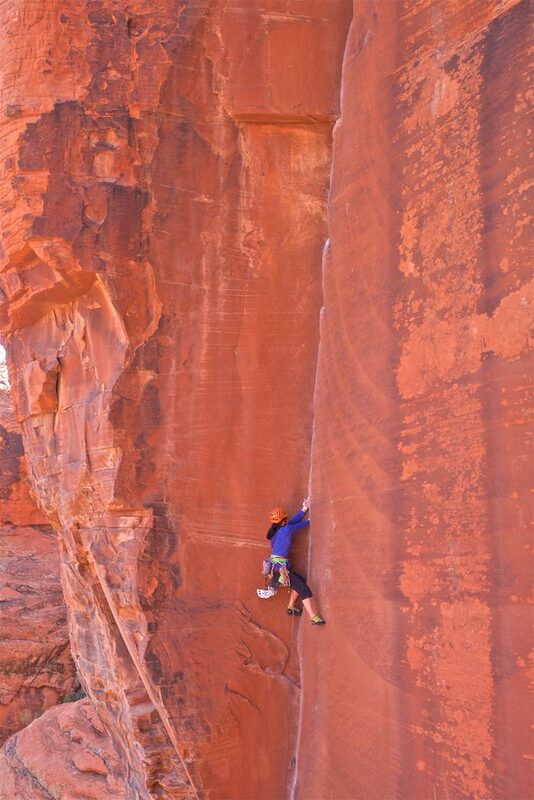 But the place the Altura really shines is the sandstone cracks and towers of the desert Southwest. 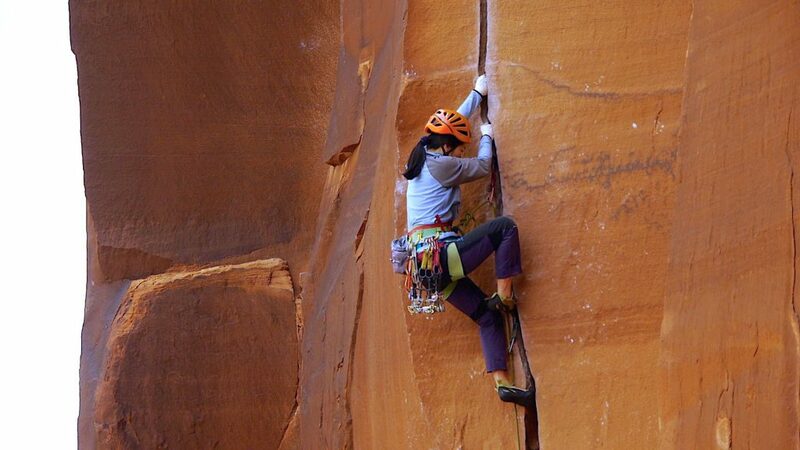 To summit desert towers you often have to climb a variety of different sized cracks. You need a shoe that can help you get up anything from finger cracks to chimneys and sometimes some delicate face climbing as well. The low profile of the Altura toe box and the semi flexible midsole allow it to slip into narrow cracks. The laces extend high enough up the upper to support the ankle during the long foot jamming cracks. 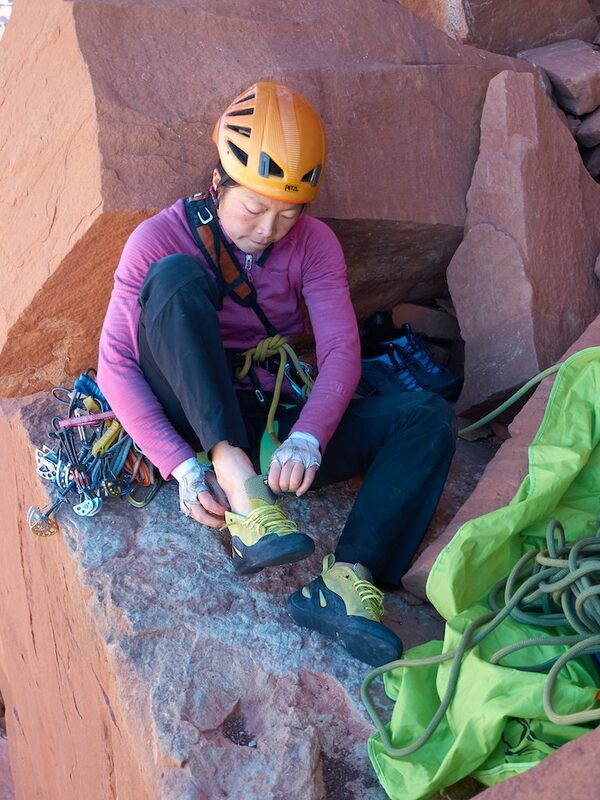 While ascending off-width cracks, the Altura’s felt secure and durable when jamming the heel and toe of the shoe. I also found the rubber of the Altura to be very sticky which gave me confidence while stemming and lay-backing steep corners. So after months of thrashing up cracks of all sizes, the rubber on my Alturas is still attached firmly to the shoe and the leather uppers had little sign of wear. I wish the same could be said for my fingers and hands! I don’t wear the Alturas on overhanging sport routes or routes with tiny edges, (Butora has other shoes designed for those realms), but for everything else they are my “go to” climbing shoes.